Closing in, on the end. Even those who don’t know me outside of this blog or some forum, have probably seen this coming. My interest has been decreasing and decreasing ever since last spring. Obviously, I’m not talking about my interest in Japan, Japanese, the Japanese, J-ent, SMAP, etc. I’m talking about my interest in being a part of the English-speaking/writing community that circles around the mentioned. I knew that clips that I had had something to do with (either recording the program, just uploading or helping to translate/subtitle it) were being saved and sold forwards. I knew that translations, comments, whatever, are reposted, altered…you name it. After some years’ break from the fandom I thought I could give it a try again. And thus, started this blog and actually got a bit active in some English-speaking boards. But as I said to someone then, the absurdness of it all and the annoyance I feel towards things like fanfiction and constant arguing, rumour mills, lack of perspective and respect (let it be towards the entertainment or fellow fans) that are behind every corner, they would probably just get worse and worse and make it hard for me to stay around. I hate, absolutely hate being wrong. How I wished that I would be. This is a book (photo by Sara, cover edited by me) that is being sold in some parts of Asia (I think mainly in Philippines and Malaysia). It includes 50 pages of lyric translations from popular pop acts like SMAP, KAT-TUN, Tohoshinki/Dong Bang Shin Ki, Big Bang, Super Junior, Fahrenheit… the list goes on. Some of my work is in there too, without any permission or credit. So are many other translators’, I’m sure. So, in short, after seeing that and failing a Japanese course last autumn because something I had put in my portfolio was found online, I’m off. Daily blogging is still on in ameblo, and some safe-deemed entries here in fc2 (yes, mostly in Japanese and which is also where the unlikely, but maybe possible, future lyricwork will be), but this will not be updated anymore. When something gets as big as the Asian “culture waves”, it attracts all kinds of people. And also, money comes into the picture. The reasons are various (and mentioned above), but this was the last straw. I won’t delete this blog, that still stands. Some people I’ve met have been real darlings. Most of you I’ll still meet in JDF or 2ch. We’ll see about JPM. Any others I’ve associated with closely wanting to keep in touch, you know my mail address. Regardless of the nature of this post, I would like to wish everyone a good new year 2009. I enabled comments so if you have something to say here (or via mail), feel free to. Had a small accident with my hard drive literally burning up. So while I’m beginning to recollect my files, you get something translated/summed up. Done in a whim, so apologies in advance if there are typos to be found. NHK’s Music Japan is airing a 東方神起-special on November the 30th, and the MJ-director 英米 [Eibei?] wrote a teaser-entry about it in the EYES-blog. I linked the song-names to translations of the songs in question. I think everyone who uses JDF at least about-actively, noticed that the server crashed a week ago. It’s not a disaster too big, the board is going to be back after this month. So, November the 1st (Japan time) we will be back in business. I posted the note in Japanese to the noticeboard and in ameblog as did the other admins, so take a break everyone. It’s only about a week. JPM, then again, is another story. It’s not a discussion forum to JDF’s extent, but more than often functions chat-like, and has its good points. The site’s had big problems for almost two weeks now, and now.. well, let’s say it’s not usable atm. Most likely it won’t be fixed in a blink of an eye. I have now good reasons to go and really focus on writing the thesis, when the only English speaking forums (JDF if 50% English anyway) I actually use are out of business. So instead of PMs, use the gmail or a comment in here. Oh. And why do I have such a.. thing with the categories? Confusing. I always try to screencap people evenly, but sometimes I swear the director has one or two good, steady close-ups and they’re both of Kimutaku. I have nothing against watching the man, but if someone wondered for the reason. Shingo for example is usually very hard to cap, not to mention Tsuyoshi. I don’t know whether or not we’ll be subbing the newest PV, but I’d like to think we’ll do one of the lives. There’ve been a lot anyway. 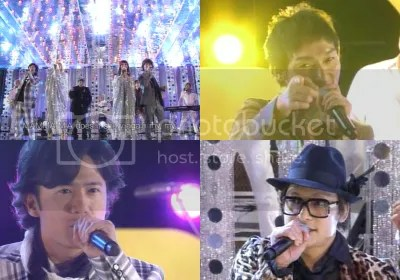 SMAP perform a wonderful, wonderful summer medley with the Japanese household name TUBE. This medley is like a picture of SMAP: There are sparkles, colourful shirts, pretty women, dancing, total frolicking, and you can feel the summer joy. Watch out for the members’ (especially Nakai’s since it’s rare to hear him actually singing a verse ’til the end without taking the mic away from his lips!) solo lines. I made an mp3-rip for myself of this and can upload it by request. Japanese version of their Korean album’s title track. Released as single in Japan October the 15th, 2008. Secured their 4th #1-spot in the Oricon Weekly singles charts practically on their first day (official chart is not out before next Tuesday, but I doubt anyone is ready to argue with me about this). Click for kanji, romaji and English translation. It’s cold in Finland and I seriously miss Japan already. So to make the longing go away for a while, part 2 of the media-SPAM. 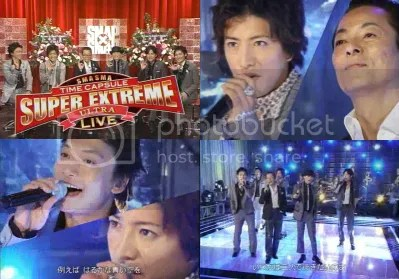 SMAP was wonderful live, and I’m not even halfway done talking about it. The famous shamisen-duo 吉田兄弟 [Yoshida Kyodai] do a surprising dance-collaboration with SMAP. 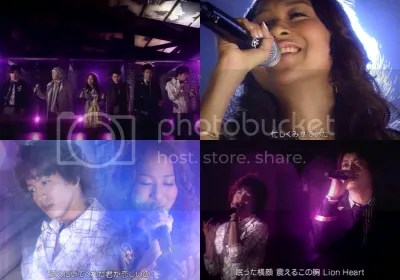 After the comedy in the beginning we hear an interesting version of 青いイナズマ. I can’t take my eyes off of Kimutaku’s.. is that a shirt? Straight back to the 80s. 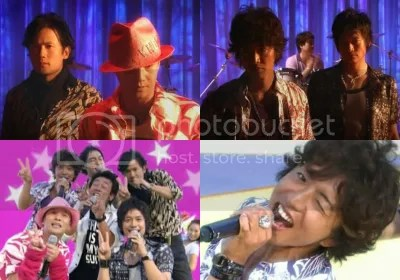 Some SMAP-members surprise with their vocal tricks. MICA 3 CHU is a temporary unit consisting of 中島美嘉 [Nakashima Mika] and comedy trio 森三中 [Morisanchuu]. Awesome. I swear the close-ups on SMAP-members look better than some (most) of their professiona photoshoots. They were having so much fun doing this that you can sense it! A note. I’m trying to get all the SxS music clips done during the weekend. And then I can get to the summarizing requests I’ve received. This blog is not dead (and neither am I), even if I haven’t updated in a while. Still in Tokyo, on my private-turned-business (…) -trip. Check あめぶろ for that. The main reason for prolonging my stay were of course the SMAP-cons and after those I’m flying back to Europe this weekend. So prepare yourselves for some updating. 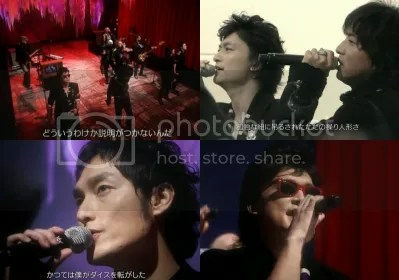 This is, however, the beginning of SMAP-mediaSPAM (pun intended). Performance-clips from SxS since May (where I had to leave off because of the crazy schedule. Info about me doing summaries in the future coming up). The sensation of 2008, pretty and talented Thelma proceeds to SmaSma. Wonderful, touching and so much emotion. ABBA Gold are one of the most known ABBA-tribute bands in Europe. Japan loves the Diva, and the Diva loves SmaSma. Full versions of both songs. Insanely cute. Perfume made their big break recently, and even if they’re (or well, at least the majority of them) complete airheads, very amusing. The electromix of 夜空ノムコウ surprised me, but flowed very well in the end. You get an mp3 of that, because it’s quite nice. As for those waiting for my reply to comments/PMs/emails, please be patient for a few more days. I’ll be sure to get back to you soon.